I just said that "don't even think about it!!" at 150mm lens test, about Xenotar 2.8. Then Jeff that New Yoker really good at persuasion, whispered: "If you made it, you will be the first and the only one who brings Xenotar to snaps, think about it!" Well, think it twice, its nearly impossible. I heard they say that fashion industry will love this kind of combination, a fast lens capture models' nature expression, and range finder helps shooter graping the timing. That is what I heard from Lambis, my Sweden pal. Where are you now? seems you disappeared, you booked a Byron, remember? Now, lets compare the lens size, a giant fits into the place for dwarf. and estimated about 700g in weight. What I did first, is to find out if the front standard available for this giant or not, or should we make a brand new for it? Asked my mechanist to expand the hole as big as possible, finally I got this, barely enough for rear element. It is hard to explain, the hole is much bigger than the shutter thread, but not for whole rear to pass. I did this for the reason to let the lens extruding out of the standard, to avoid the collision of the struts. HEY! You won't think this Xenotar-version-Byron still got the ability for lens interchange? It will be dedicated for this lens only. But you can take it off when folding camera. 1. front standard is made of a 2mm steel plate, strong enough for Ysarex, but not for this dino. luckily we almost has solved it, so it is strong enough to hold the lens, but the plate is still too thin visually. 2. lens need to be extruded out, to avoid collision with struts. I've ordered a special front plate, in 8mm thickness, to enforced the original 2mm plate, also providing lens extruding and flange fixing. Enforced plate is coming, needs some further process, but it looks great, definitely strong enough for that BIG EYE! 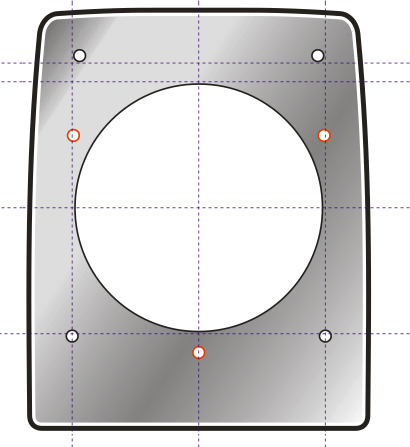 Four holes at corner for plate and standard, three by the lens hole, that is for flange. Seems like that I really make it! Sweden Lambis, where is your Xenotar? It's a sunny day, rarely happen in Taiwan's winter, always raining. Lens mounted onto Byron, bellows was tailored by normal silk one, cut a few front folds for bigger hole, for temporary test, thus shorten it's length that I can not extend the lens to the limit, but no problem for infinity. Surprised that it actually feel not bad when holding in hand, I thought it would be very heavy, but it is not, thats good. Focusing in 2.8 aperture is very much easy and comfortable, image is bright and clear, edge to edge, with my gg panel, even no hood needed. 3. How to mount/unmount the lens? Right now, screw/unscrew the front/rear element is the only way. 4. Bellows needs to be redesigned, for bigger rear element. Bellows hold until next month, I need to do Jan batch of conversion works. Why sleepless? I squeeze myself until there is no juice in my brain anymore, then I sleep like a pig every night. That is really a good try ... I really want to see the result ASAP! I have ordered a Cooke Portarit len PS945 few months ago, but it is 227mm focal lengh, not yet deliveried, do you think it can be mounted on Byron? You nuts Jack! Byron got flat bed barely long enough for 150mm lens, how long the extension tube I need for 227mm lens? And 20mm rail moving range makes 150mm lens focus at no nearer than 5 feet, 227mm maybe go out of 8 feet! You are killing me, Jack! Daniel, if you made it, you will be the first and the only one who brings Cooke PS945 to snaps, think about it! I already have my second 110B ready for you!!! Tell me Jack, a lens keeps you at least 8 feet away of the object to focus, will you still want to use it for snap or portrait? You do? Really do? Then send the lens to me. No hurry, the len still not yet arrived ....... let's get my 1st Byron first ... !! let's shot some portarit from that BIG EYE ... HANDHELD!!!! I do hope to do so, but this temporary bellows keeps me doing this, its length barely allow lens stay at infinity, but no near, I need to remake a bigger size bellow for it, then I can shoot at about 5 feet distance.